at a higher resolution, in the PWD Historical Collection Online Catalogue. includes additional photos of PWD facilities not in the PWD Collection. This conduit, when completed, connected the Torresdale Filters with the Lardner's Point Pumping Station. 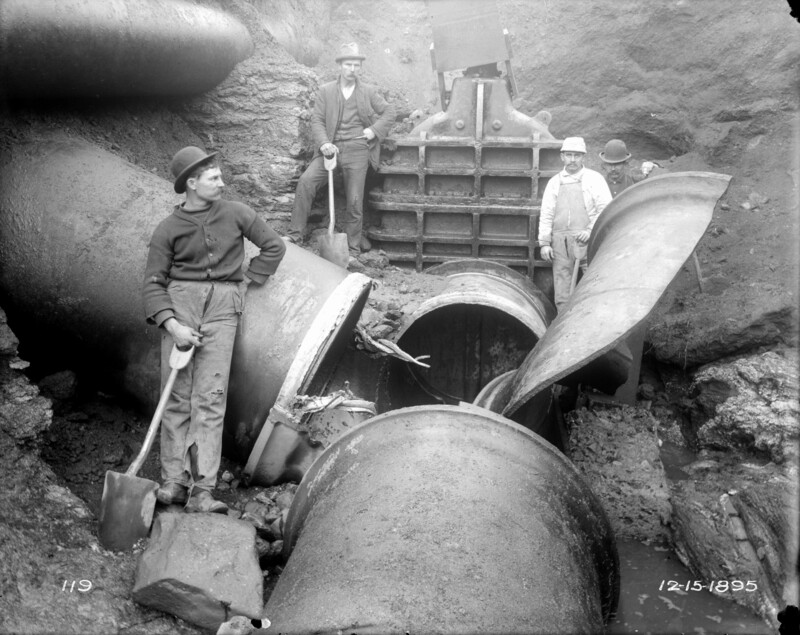 For years these glass negatives, stored in a City pumping station, were known only to a few engineers in the PWD Construction Division. Bob Walker, PWD's first manager of public relations, and his assistant, graphic artist Bernie Rosenberg, were let in on this secret in the early 1980s. They were amazed by what they found: scores of wooden boxes holding thousands of fragile negatives that, when closely examined, yielded a treasure trove of information. All told, Bob and Bernie rescued 3,276 negatives, each of which has since been cleaned, catalogued, and scanned at high resolution. The best of those images--almost 1,600--are now posted on the PhillyHistory.org website, created and maintained by the City of Philadelphia Department of Records. The small images presented on PhillyHistory give only a glimpse of the information recorded in these pictures, which includes everything from landscapes and streetscapes that are long gone, turn-of-the-century construction methods that straddled the transition period between horsepower and automotive machinery, down to the hand tools, clothing, and hair styles of the foreman and workmen. In some images, when viewed in high resolution, labels on equipment such as cranes, steam engines, and wheelbarrows are clearly discernible. PhillyHistory website programmers are working on a zoom feature for its image interface, which should be up and running sometime in the next year. Until then, click on any image on this page to open up a high-resolution version. I guarantee that the detail will astound you. Since the images required long exposures, the photographers must have asked the people who appear in the photographs to stand still, which most of them did. But others did not, and they appear as shadows, as ghosts of the thousands of workers who built the city from the underground up-work that, in some ways, I feel a personal connection to. For several years I worked for a garden design/build firm doing similar manual labor, albeit on a much smaller scale: digging holes with pick, spade and shovel, moving piles of material from here to there and sometimes back to here again. I sometimes have the eerie feeling, as I enlarge these images in Photoshop, that if I can get them large enough they will envelop me, I will be able to step out of my life and into the picture, go back in time and see how life and work was done back then. Of course, I'm always disappointed. They are, after all, only pictures, only two dimensional, and all I can do is look at the scenes, look into the faces, and wonder: what exactly are they doing? What are they feeling? 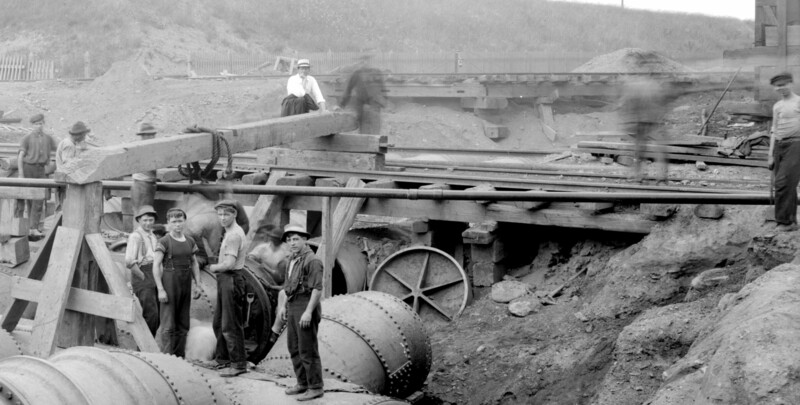 I know what they are building, since, in many cases, these monuments still stand (or sit underground): reservoirs, filtrations plants, pumping stations and pipelines still used by city residents every time they open a faucet or flush a toilet. But I want to know more: all the little steps of their work, what each tool, each scrap of lumber is used for. I want to know what they say to each other, what they do when they go home at night, how they (or most likely, their wives) get the filth and muck out of the white shirts that so many of them seem to wear. We welcome your input about any of the photographs. Many of the descriptions are cryptic, and we would love to know who some of the people are, or what is happening in some of the more complicated construction scenes. 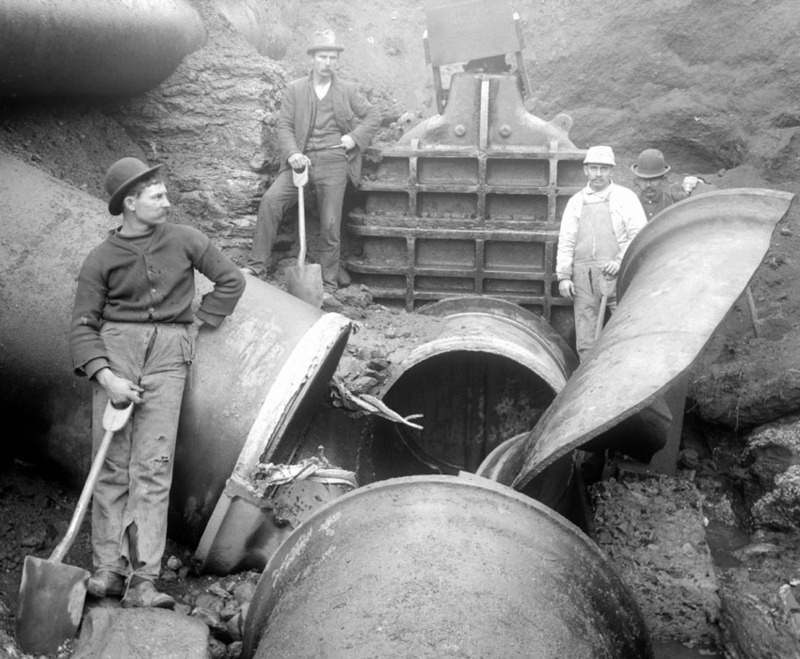 We also welcome corrections of errors, as well as additions to or refinements of locations (for example, we have many photographs of a pipeline being built along Wissahickon Avenue, but no locations are given because no cross streets are named). 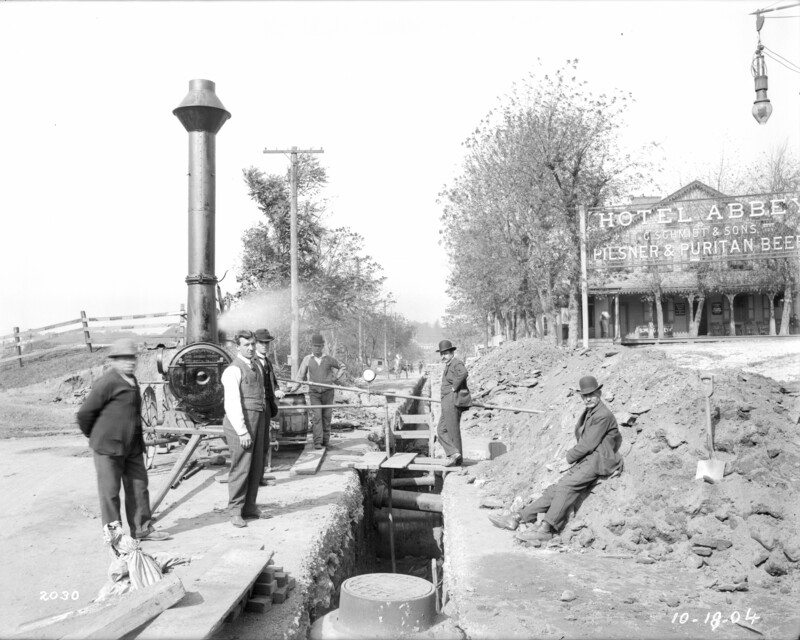 Finally, we are always looking for more photographs, books, plans, blueprints, reports, letters and any other documents and records either of specific water- and sewer-related projects or pertaining to any of the city's rivers, streams, and watersheds. Contact me if you want to share such material. We would be glad to scan your originals and return them to you. Comprised of 11 separate photographs, this is one of numerous panoramas to be found among the photos in PhillyHistory's PWD Collection. in the PWD Historical Collection Online catalogue. additional photos of PWD facilities not in the PWD Collection. Under the Collections tab, uncheck all the boxes except the one next to "Phila. Water Dept. Photographs"
Also under "Advanced Search Options" make sure the box next to "Records Changed" reads "Anytime". Now, if you simply click "Search," you get 1,580 hits--in other words, the entire PWD online photo collection. Searching within these 1,580 photos will help you find specific topics of interest. In the expanded record for each individual photograph, "Descriptions" include the photographer's original caption, where available, and other information about the photograph we have added in brackets. The "Title" is actually a topic heading. The following is a condensed list of all the titles, or topics, in the PWD Collection. Please note that other collections on PhillyHistory may also contain images relating to these topics, so searching all the collections on the site will likely result in more hits. 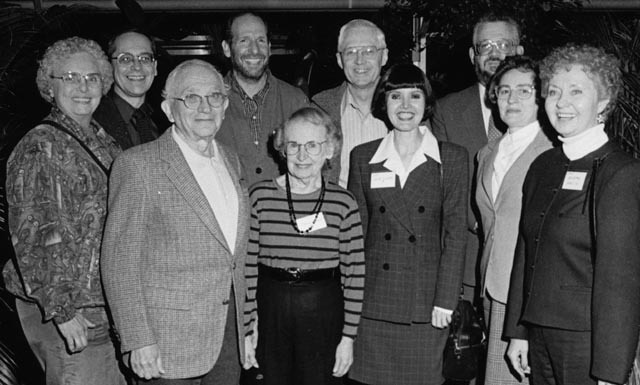 Starting with Bob Walker and Bernie Rosenberg (see above), many people deserve credit for bringing this photograph collection out of the gloom of a dusty, ill-lit, rarely visited room into the bright light of the Internet. C. Drew Brown and Ed Grusheski, of the PWD Public Affairs division, supported the work of numerous interns and volunteers to catalogue this collection, and later, my own consulting contract, during which I have overseen the completion of the task. Shillest Clayton, then a graduate intern with advanced computer skills, first recommended the purchase of the PastPerfect cataloguing software that we use in the Archives. But it took Joe Shapiro, a retired naval engineer, to teach himself (and the rest of us) how to use the program. His first task was to catalogue all the glass plate negatives, and he has since catalogued many thousands of other photographs, prints, reports, and books that are included among the roughly 16,000 items in the collection. Once the plates were assigned ID numbers, Natalia Broz, a Drexel student who served as Archives intern in 2004, scanned every one of them. She also performed initial editing of the scans, burned back-up DVDs that we still use, and was generally a vibrant and cheerful presence that all of us still miss. Charles Williams, a long-time PWD volunteer, also worked on the project early on. Thanks also to Joan Decker, commissioner of the Department of Records, for asking us to contribute our images to her department's online archive, and to the staff at Azavea (which created the PhillyHistory site for the city), especially Robert Cheetham, Deborah Boyer, and Michael McLarnon. Finally, thanks need to go to PWD Archives volunteers, Pauline and Daniel Greene. Lifelong Philadelphians born within a month of each other in 1917, they were married 64 years and passed away within month of each other in December 2008. We have named this collection in their honor, since they spent many Mondays over many years working with the glass plates. Perhaps their most difficult task was to carefully clean each of the 3,276 plates with distilled water. Besides this work, Dan and Pauline performed many other tasks in the Archives, always with good cheer and an attention to detail that was much appreciated. They came to PWD as volunteers with Ed Grusheski, retired Manager of Public Affairs, in 1988, having volunteered with Ed in his previous job at the Philadelphia Civic Center Museum. Their hard work and dedication will be missed, as will Pauline's perfectionism, which was balanced by Dan's droll sense of humor, his red nose and his sleight-of-hand coin tricks. 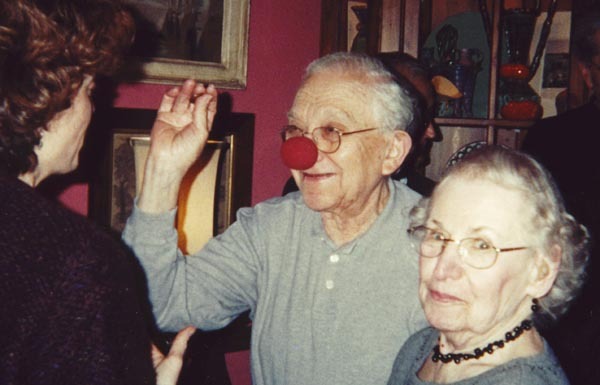 Dan, in his clown nose at a PWD volunteer party, pulls a quarter out of someone's ear.